We sell and service gas detection equipment used for confined space entry and other safety related applications. 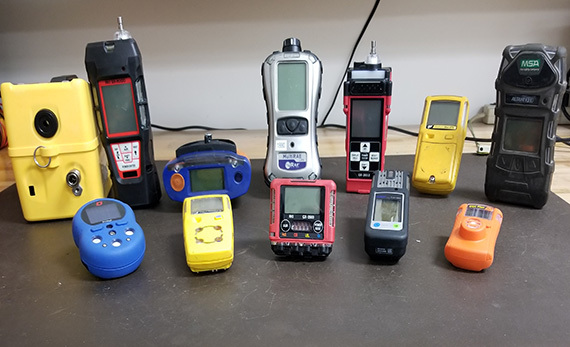 We offer repair, calibration and maintenance services, on many different manufactured brands of gas detection equipment. These detectors are designed to detect gases well before they become harmful. Safety Instruments provides both in-house (Bench) service on portable equipment and On-Site (Field) service of fixed (stationary) systems. We inspect, test and calibrate each detector to meet manufacturer performance specifications. Parts subject to deterioration, such as sensors, batteries and filters are replaced at regular service intervals, to ensure proper operation. Safety Instruments offers Monthly, Quarterly and Semi-Annual service agreements. After each visit, we send the equipment owner a service report. The report outlines all work performed, all calibration and test data, the calibration equipment used, as well as the service technician’s name. Maintenance is required on all gas detectors to insure they work properly. Maintenance includes but is not limited to sensor replacement, filter replacement and pump cleaning. OSHA 1910.146(d)(4) States that an employer must provide equipment that is maintained and to ensure that employees use that equipment properly. Typical repairs involve the replacement of pumps, battery packs, flow blocks and tubing as well as the replacement of circuit boards and displays. We provide free technical phone support, to our customers. Our factory trained service technicians can answer your questions and provide you with the information and equipment you need for your application. Contact Customer Service Toll Free at 1-877-832-4737 for help in selecting the best air monitor for your application. Our inside sales dept. have experienced professionals that can answer all your questions regarding this equipment. Safety Instruments has been servicing our gas detection equipment for years. We would recommend them to others. Safety Instruments is a valued partner. I rely on them for fast and expert service. Safety Instruments people are knowledgeable and helpful. Their staff are well trained and provide the best service. Safety Instruments provides fast, prompt service. I am very happy with the repair turn around and the quality of their work.